To Prepare the Duck Confit: Combine the salt, black pepper, bay leaves, thyme and garlic in a Pyrex bowl. Add the duck legs and toss, heavily coating the legs with the seasonings. Cover and refrigerate overnight. The next day, wipe away salt and seasonings from the legs. Arrange the legs in a pan or Dutch oven just large enough to hold the legs. Melt the lard in a sauce pan on low heat. Pour enough melted fat over the legs to cover completely. Let the pan cool down. Remove the legs from the cooking fat and place legs in a single layer, in a terrine or bowl just large enough to accommodate the duck legs. Ladle enough of the cooking fat over the pieces to cover them completely. Cover the terrine and refrigerate for 2 days to allow the flavors to mellow. 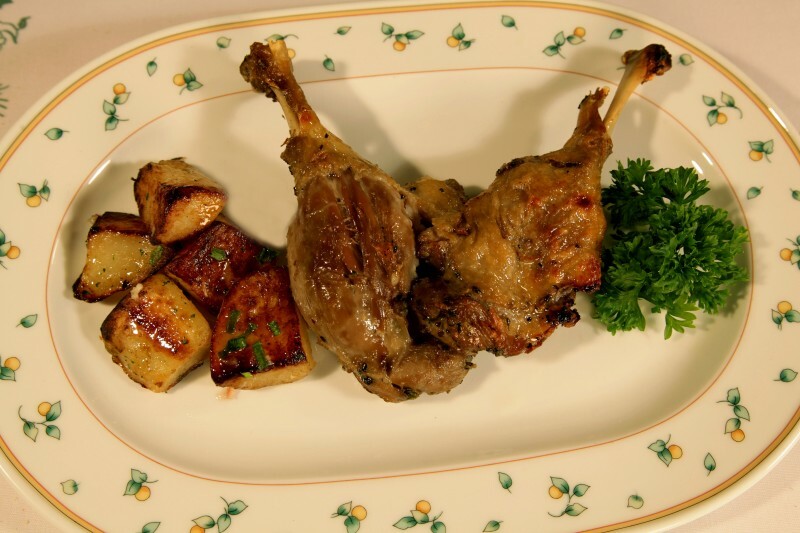 To Serve Duck Confit: Remove the duck legs from the fat, scrape off any excess fat. Place legs in a baking pan and bake at 350 degrees until the skin is crisp and the meat is hot, approximately 30 minutes. Serve 2 legs per plate with the sautéed potatoes. To Prepare the Potatoes: Wash the potatoes. Place unpeeled in a 2-quart saucepan and cover with cold water. Bring to a boil, reduce heat and simmer about 15 minutes. Test for doneness by piercing potatoes with a large meat fork. The fork should meet with some resistance. Cool the potatoes under cold running water. Peel the potatoes, cut them in half, then into 1 inch thick slices, then cube. Heat the oil and butter in a heavy skillet. When the butter begins to brown, add the potatoes. Cook the potatoes until well browned and crisp, tossing frequently for approximately 5 minutes. Add the scallions, salt and pepper. 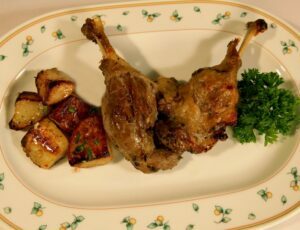 Toss and serve with Duck Confit.